Visitors to this year’s Carole Nash Irish Motorbike and Scooter Show at the RDS in Dublin are in for a special treat — with three exciting new Triumph motorcycles on view in Ireland for the first time. 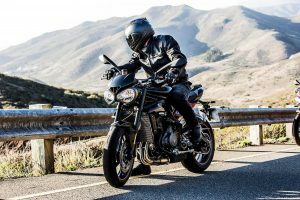 Triumph announced today that Irish motorcyclists can look forward to seeing the Bonneville Bobber, Street Triple 765 and Street Scrambler models for the first time on these shores. The Street Triple 765 was only unveiled on January 10th and this will be time it has featured at a Motorbike Show anywhere in the world. The Triumph launches will be one of the many highlights at the show, and demonstrates the prestige which major manufacturers attach to the Irish event. Jeff Murphy, Managing Director, Dublin Triumph, Rosso Ducati & Dublin Harley Davidson, said: “We are very excited about the Carole Nash Irish Motorbike and Scooter Show this year as we will be launching a host of new bikes across all our brands. For us this is the ideal platform to unveil so many brand new models to a huge gathering of motorcycle enthusiasts. We are particularly excited to be showcasing the Street Triple at the show. It will be the first time in the world that the public at a motorcycle event will get to see the bike in the flesh. The Triumph Bonneville Bobber can trace its heritage back to the 1930s. The newest version keeps up the tradition of those early bikes, boasting clean lines and low stance, single seat, wide flat bars, minimal bodywork and headlight, sculpted tank, wire-spoked wheels, with wide rear wheel and that all important hard tail look. An all-new chassis, suspension and frame deliver a supremely confident, dynamic and comfortable ride. Triumph has also improved the engine on the new model by taking its 1200cc high-torque engine and upgrading its electronic and adding a new dual airbox/filter design which enables it to produce more torque and power down low, when compared to its immediate predecessor the Bonneville T120. The new Bonneville Bobber has a 27-inch seat height, 2.4-gallon fuel tank, 503-pound dry weight, is available in Jet Black, Ironstone (gray), Morello Red, and Competition Green and Frozen Silver. The price will be announced at the show. Entering what is commonly known among the motorcycle fraternity as the “Naked Class”, the all-new 2017 Street Triple line up caters for anyone looking for an everyday ride or a full-on track experience. With three options available, the new Street Triple S, R and RS, each come with their own unique tailor-made level of power, performance, technology and suspension.